“Twist” is filthy with meaning: it’s the unexpected, it’s surprise, it’s even an amazing ice cream choice. What does “twist” mean to you? I love street art. I often find that the beauty and essence of a place is captured in how local people decorate the spaces around where they live. Mexico, you did not disappoint. On a recent trip, I was delighted to stumble on a graffiti series gracing the construction barrier on the beach in Playa Del Carmen, Mexico. 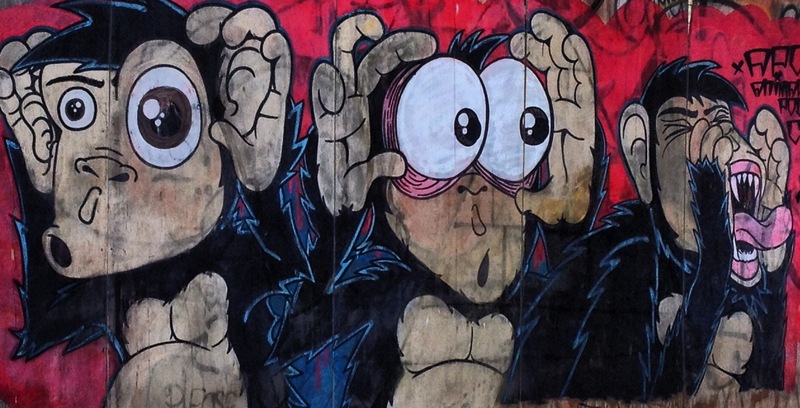 This fun twist on “hear, see, and speak no evil,” captivated my attention. I couldn’t help but capture it before strolling on down the beach on that beautiful, scorching hot day. This week, share a photo of something that says “twist” to you. It might be that perfect ice cream cone, a yummy bit of liquorice, or something unexpected that surprised, shocked, or startled you. Here is mine: TWIST ME BABY!! This will take some thought. Nice one, Queenie 😀 Love long exposure shots! how come my post is never listed below?? hi Krista, thanks for inspiring us! Great challenge! I have a lot of material to choose from. I think it could be a good idea to reverse the chronological order of the comment section in these Weekly Photo Challenges. The way it is now, the ones that comment first are always on top, which generates more visits to their blogs than to the ones that comment later during the week. If the chronological order was reversed, I believe it would generate more clicks to the late arrivals and that way spread it more evenly. Agreed, it would also be nice if the entries/comments opened in a new tab when you clicked on it. That way you never navigate from the page and can click on other entries too without having to hit the back button. Just hold ctrl when you click a link and it’ll open in a new tab. I’ve been thinking about it for a while and I’ve even checked the stats to back up my statement. Agreed! And thank you for the great tip to hold Control key down. Yay! Great idea – and about the control key – just very USEFUL. Thank You! Completely agree with you Cardinal. If you want to see the most recent comments later in the week, you have to scroll and click repeatedly. I second the motion. I’ve thought that for a while. It gives people in certain time zones an advantage. Definitely. I live in the “advantage time zone”, but I’d like to see a more fair solution to this. That will be Fun! I am working on it! I choose the Double Sun Image this time. That will be fun to work on a second for this week. – macro images dug out for this one! Hello! This is my interpretation: http://road-tripping-europe.com/blog/2014/05/weekly-photo-challenge-twist/ Have a nice weekend! Not sure why I have two pingbacks, but please remove the first one if you have time. Thanks. Wow, what a beautiful piece of art. Now on to figure out where to find the “twist” in Panama. It’s so awesome 🙂 . I rarely see nice street art here in Manila..
450 Responses While this challenge is closed to new entries, we encourage you to visit the Reader to find other avid bloggers. Lein On The Free Lane Miracle, It Is. As I See It Finders, Keepers? I certainly hope not. 2 Geeks @ 3 Knots Twist: Rotate! Lake Superior Spirit Plot twist! jak & Cimmy's Journal Jar Weekly Photo Challenge: Twist! my cyber house rules Weekly Photo Challenge: TWIST! Foto Challenge Twist my eyes…. The Blessing of Animal Companions Weekly Photo Challenge: Twist: Walking the Cat? LenzExperiments WPC: Do the ‘Twist’! blinded by light Handy in Winter! blueribbonfair What I Wore. Thinking of that Thursday -and a photo challenge. Hope* the happy hugger Weekly Photo Challenge: Twist. Tish Farrell Last Warrior Standing?